One of the worst examples of how Detroit: Become Human copy-pastes from black history. To quote a time-honored African-American turn of phrase, video game developer David Cage owes black people a check. I went back to playing Detroit: Become Human after a few weeks away because it bothered me. The opening sequences of the game warned of a narrative that would be unsubtle and awkward, yet there was a masochistic part of me that wanted to see if it’d ever get past that. Another part of me needed to investigate a nagging feeling: Every time I saw a black face in Detroit: Become Human, I felt suspicion, and questioned why it was there. Detroit: Become Human is a game about android liberation, told through three main characters who’ve broken their programming and become “deviant.” They are revolutionary leader Markus; runaway housekeeper Kara; and Connor, the police investigator tasked with hunting down his own kind. The new game, made by Cage and dev studio Quantic Dream, revolves around the moment when the humanoid automatons created to serve humankind gain free will. Seeing as how the androids were created by people, it stands to reason that this cyber-civil-rights-movement would closely resemble ones when humans threw off the chains of oppression at various points in history. One of the most familiar examples of this kind of freedom struggle comes from the black experience in America, where multiple generations of a people who came to this continent in chains have worked to have their full humanity recognized legally and culturally. Many of the engagement strategies and much of the modern iconography around latter-day movements for equal rights comes from the 1960s Civil Rights Movement. Almost everything about Detroit points back at that iconography. The setting, certain ambient music choices, and textual references seek to wrap the game in black cultural signifiers. Look at the murals with a woman with a glorious afro and two boxers in the ring. They’re meant to stir up feelings of extraordinary poise and resilience, and tie those feelings to the plot of Detroit. But that creative decision calls on a wrongheaded assumption about how black people live under white supremacy. Black people don’t have superhuman powers of endurance. We’ve been broken and killed under this country’s unjust laws and attitudes. But, when cultural productions paper over suffering with stoic nobility, historical memories become more marketable, more palatable, and less illuminating. Another example pops up in the relationship between the android Connor and human police detective Hank. When you first analyze the desk of Hank, you’re told that he likes heavy metal. Later, when you enter his home, you’re told that he likes jazz. The pictures that Connor finds that unlock the information that Hank likes jazz. There’s nothing inherently dissonant about liking two different forms of music, but the framing of these musical taste moments felt off. Players find out about the heavy metal at the beginning of their odd-couple relationship with Hank, when he’s still being a jerk. Connor finds out that Hank likes jazz after he finds him drunk and passed out on his living room floor, in a sequence where it felt like jazz gets used as a way to give Hank some “soul”—a mournful shading of character that’s supposed to add depth. But depth is the last thing I took away from that cheap moment. One of the most cringe-worthy examples happens with Luther, the black android who players meet in the second half of the game. When Kara and her young charge Alice meet him for the first time in the house of would-be ally Zlatko, they react with terror. It’s hard to believe his size is the only reason for this reaction. Cage is clearly leaning on the trope of the Big Scary Black Guy™ here—a centuries-old “Africans are subhuman beasts” idea that ties in with modern-day political propaganda like super-predators. Later, Kara meets Rose, a human woman who helps androids cross the border into Canada, where they can live better lives. Yes, it’s an incredibly ham-fisted allusion to the Underground Railroad, but the game isn’t content to leave things there. Rose calmly tells Kara that, in essence, the androids’ plight is just like that suffered by black people for centuries. 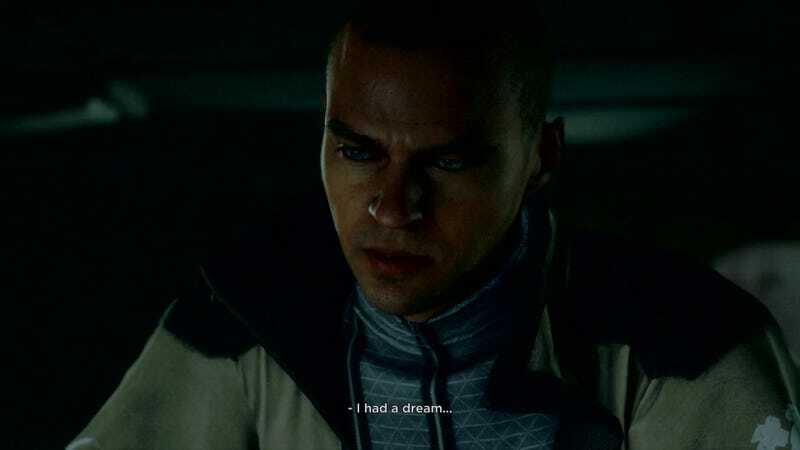 While Markus, Rose, and Luther are all important characters in Detroit’s story, they only feel important because of how they can be used as shorthand symbols connecting to the real world. The problem with this allegorical approach is that it flattens the complexity and nuance of real-world experiences of black people who’ve lived under oppression. Cage and his co-creators haltingly implement scenarios of situational ethics in Detroit, but the moments where compassion or consideration win out are given short shrift. The shifting moral landscape of the game seems to exist only to justify a replay of cruelties visited on oppressed peoples. The choices we’ve had to make weren’t always easy binaries, and Detroit does little to speak to the psychological weight of having to make such decisions. It’s ironic because the one thing I like about Detroit is its impressive narrative architecture. Each chapter ends by showing you the branching pathways that your choices open. The idea isn’t new but there’s a compelling level of transparency to its implementation here. However, being able to see all of that just highlights how poor existential imagining cripples Become Human’s characters. Markus and the other androids in the game keep calling themselves people but we don’t know why they think they are. In pivotal moments, players push the three main characters past rote programming and into free will but, largely, their sentience gets treated like a light switch. Detroit doesn’t do enough to walk players through the androids’ self-conception. What is it that they understand about human nature and their own existences? Black people in the United States had all manner of laws prohibiting their right to assemble, vote, or own property. The infamous three-fifths compromise during the Constitutional Convention of 1787 made it so that black slaves were not considered fully human, but their numbers would still be counted to help determine how much political power white Americans would wield. Until the very end of Detroit, we get almost no sense that any similar debate was ever had about the moral and ethical implications of building these human-looking machines. At its best, Detroit is laughably facile and, at worst, insultingly reductive. It’s an under-realized work that sacrifices interesting character development for making “statements” that are simultaneously heavy-handed and light as a feather. David Cage continues the practice of using black bodies, lives, and culture as nothing more than loaded symbols in American history and arts in its worst forms in Detroit. To quote another time-honored African-American turn of phrase, I wish he’d kept our names out of his mouth.